SAJJ Mediterranean invites families to kick-off the summer months with their Family Meal Deal! 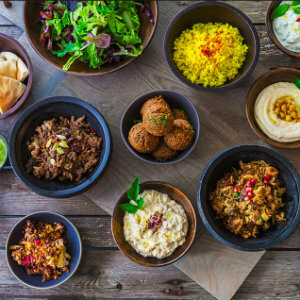 The feast for four ($29.95) includes Falafel, Chicken Shawarma, Mixed Green Salad, Rice, Hummus, Tzatziki, Pita Bread, & Sajj Sauces, a festival of flavors that the whole family can enjoy (vegetarian options are also available and steak can be substituted for $4.95). SAJJ, which has made a name for itself for offering traditional Mediterranean dishes that take guests on a culinary adventure, is located at 22245 El Paseo Suite A in Rancho Santa Margarita. The Family Meal Deal is available for takeout only when ordered online weekdays from 3 pm - 8 p.m. and all day on Saturdays and Sundays. SAJJ’s high-quality cuisine begins with locally-sourced produce and antibiotic- and hormone-free Halal meats in an effort to create fresh, healthy, and sustainable menu offerings. To create an experience that is inviting and inclusive to everyone, SAJJ also offers a variety of gluten-free and vegan dishes.